Evernote, a note-taking, organizing and archiving app developed by Evernote Corporation which has gained its popularity over the years based on its services. Evernote focused on the user’s requirements, found that they often copy paste the links form the Google’s Service. So, it worked with the Google and now successfully announced that Google Drive will integrate for Android and the web apps running on Chrome. 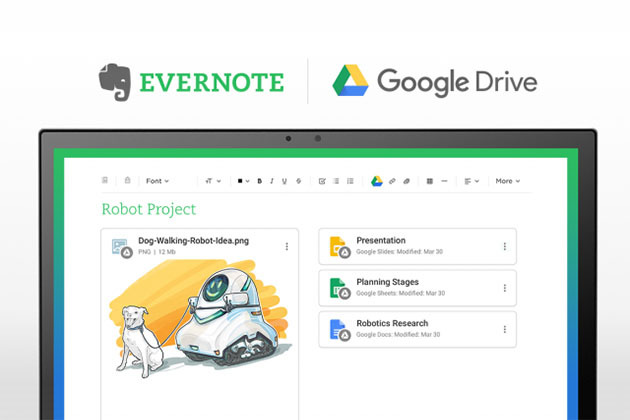 This integration between Google and Evernote is definitely a new life to the Evernote which is noticing a kind of pressure from competitors including Microsoft’s OneNote. With this integration Evernote users will be allowed to access files from the linked up Google Drive which results in the productivity of the work. Evernote reveals that half of its users have Google accounts and with this integration every Google Drive account holder can access their files into the Evernote app. The other feature of the new integration gives a splendid visual experience with the preview of the linked content. The content includes pictures, documents, sounds and videos and the users will be allowed to work simultaneously on variant documents embedded in the same master Evernote file. Besides seeing URL, Evernote users can now browse anything created and stored in Google Drive inside the Evernote notebooks. And the most interesting thing is, any changes made to Google Drive files will automatically get updated in the Evernote. Evernote provides 60 MB of free cloud storage for its users to store notes. They get access to 15 GB of free storage from Google, with inexpensive monthly premium. “We want anyone using Drive to have access to their content whenever and wherever they’re trying to get stuff done. That’s the cloud at its best,” said Alex Vogenthaler, product manager for Google Drive. Evernote also promised that “this is just the beginning” and “even tighter integration” will happen soon. The new integration beta is now available for Google Chrome and Android on the Google Play store. And Evernote announced that it would soon the iOS and Windows platforms will be receiving the same integration. Next articleDoes GENES Determine Educational Achievement and Job Success In The WOMB?